We are thrilled to be supporting Beaumaris local Simone Brick as she competes in the IAAF World Mountain Running Championships in Andorra in September. In this Q and A, the 24-year-old tells us about the event, how she’s feeling and how Muscle Freedom has helped. This is the short course championships. It’s on every year at the moment (that’s changing in the future). Essentially, they change every year from being either an ‘up year’ or an ‘up and down’ year. This is just an ‘up year’. My race is 12km from the bottom of a mountain in the Pyrenees to the top. There’s about 1,100m gain over the 12km. It’s like the World Cross Country equivalent in mountain running. What have you been doing to prepare? Heaps! I’ve been doing one or two sessions a week on a treadmill in an altitude chamber at ProSport. We set the altitude to about 3000m above sea level. I’ve been sleeping under an altitude head tent at night. The race starts at 1,500m above sea level and it ends at about 2,500m above sea level, so it’s pretty high. Other than that, I’ve been doing a lot of sessions at places like Mount Dandenong and Arthurs Seat, just trying to find some trails and hills. How are you feeling in the lead up to the event? Good! My prep has been amazing, so I’m looking forward to actually using that and putting it to good use for the race. How has Muscle Freedom helped? So much! I’ve been there once or twice a week. I’m still relatively new to running, but also very new to mountain running. I only started mountain running in March this year. Trying to get my body to adapt and my calves to be happy has been a bit of a battle. I honestly wouldn’t be going; I wouldn’t be running if it wasn’t for my massages every week. 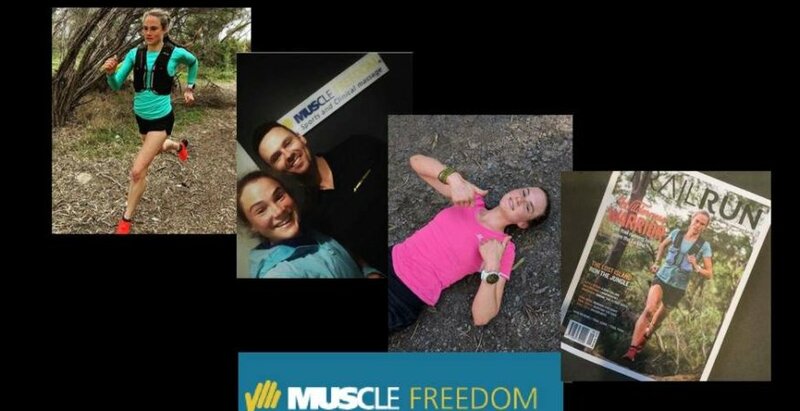 Me and the team at Muscle Freedom have been working with Simone since she started her running journey. It’s been extremely rewarding to watch her become a national champion and represent Australia in the sport she loves. I am delighted to be able to assist Simone in Andorra in the lead up to the event. I wish her all the best and have no doubt she will kill it.